The 2019 Jeep Grand Cherokee is an adventure given physical form in the most stylish way possible. Everything about this model is engineered to be fresh and exciting so that drivers are able to confidently explore the wonders of the world. As a spacious and flexible full-size SUV, this model is able to handle any type of cargo from passengers to camping gear. Drivers will also always feel secure in knowing that it is fitted with a healthy list of standards, including preventative safety features. Stable, spacious, and safe, the 2019 Grand Cherokee is a vehicle you can depend on to get you through the best and worst that the road of life has to offer. The 2019 Grand Cherokee, when it comes to design, may be modern and at the peak of innovation, but deep down it still maintains the rough and tumble attributes Jeep is known for. While its interior design may be flexible, its performance is firm with superior off-road efficiency and commanding power of up to 707 horsepower which can tow up to 7,200 pounds. Many would understandably believe this type of power comes at an extreme cost to the fuel economy of the 2019 Grand Cherokee, but with the option between rear-wheel drive and all-wheel drive, this model can offer a rating of up to 26 mpg highway. So for those who are ready to embark on a modern adventure, the powerful, contemporary, and all-around evolved 2019 Jeep Grand Cherokee awaits. The exterior of the 2019 Jeep Grand Cherokee is honestly nothing you would expect from such an adventurous vehicle, but this unique, sleek, and modern SUV offers a sense of freshness and freedom that can’t be mimicked. The front features a timeless vertical seven-slot grille which offers a sense of boldness, while the sleek headlights with LED lighting light up your life with their modern flair. This model year featured a revised rear design with bolder tail lamps and a more centered license plate that makes you love watching it go as much as you love watching it come. Even the sides of the 2019 Grand Cherokee are polished with trapezoidal wheel arches with up to 19-inch wheels that are sure to make a distinctive impression, and larger windows for increased visibility at all times. The exterior of the 2019 Grand Cherokee is not just nice to look at though; it’s also functional. Come rain or snow this adventurous titan has you covered with available heated mirrors, windshield wiper de-icer, and rain sensing wipers, which will turn taking on the elements into a walk in the park. Unmistakably dynamic and highly efficient, the 2019 Jeep Grand Cherokee combines signature Jeep branding with an appealing one-of-a-kind design that is assured to bring out the adventure in your life. The exterior of the 2019 Jeep Grand Cherokee was built to last miles beyond expectation, but the interior was built to make every one of those miles a genuine pleasure. Crafted with a purpose, the 2019 Grand Cherokee is all about providing comfort, style, and customization as drivers get to choose between some of the highest quality materials and technology on the current automotive market. The 2019 Grand Cherokee measure to be 189-191″ L x 77″ W x 68-69″ H and can comfortably accommodate up to five passengers. When it comes to cargo space, there is always room to spare with up to 68.3 cubic feet when all rear seating is down and 36.3 cu. ft. even with a full passenger load. This space is completely flexible and easy to access with 60/40 split simple-fold rear seating and easy slide rear seating. Addition storage can be found throughout the cabin in small storage, as well as a hidden load floor beneath the truck for added security. No matter what your next adventure may be, the 2019 Grand Cherokee will make sure you are always prepared. Getting to the more luxury features of the interior, the cabin can be fitted with heated and ventilated Nappa Leather seating and steering that will captive all your senses with its refined looks and soft texture. In addition to this, you will find a long list of other premium features that are sure to make you feel more at home than you ever imagined while on the road. The command-view dual-pane panoramic sunroof opens up the entire cabin for a sense of freshness as you take in and relish the world around you from every angle. The memory system allows the Grand Cherokee to adjust everything from seats to mirrors to radio to exactly how you like them with the press of a button. There is also a media hub with a touchscreen Uconnect infotainment system with smartphone and Bluetooth connectivity, voice recognition, two USB ports, and a rear media hub with ports for the back seat passengers. The media system is then enhanced by the Alpine premium sound system which allows you to become immersed in your favorite music as nine speakers and an 8-inch subwoofer fill the cabin. Finally, you will be able to completely personalize your instrument cluster for a more driver-friendly experience. The 2019 Grand Cherokee is truly masterfully crafted to please even the pickiest of drivers with its stunning cabin accommodations. Upscale and ready to adventure, this is truly a one-of-a-kind vehicle. On the inside and outside the 2019 Jeep Grand Cherokee looks refined and modern, but Jeep blood still runs to its core allowing it limitless capabilities. When it comes down to the facts, The 2019 Grand Cherokee offers five commanding engine options that are as efficient as they are powerful. The base engine is a 3.6L V6 that produces as respectable 295 horsepower and 260 lb-ft of torque. This comes standard with the lower level trims and is impressive for the value. The 5.7L V8 commands the road with 360 hp and can tow up to 7,200 pounds. This engine is optional on Limited, Overland, Summit, and Trailhawk trims. It is an excellent middle ground option. A more alternative choice is 3.0L turbodiesel option that delivers 240 hp and 420 lb-ft of torque and can push that towing limit to 7,400 pounds. This is a great option for those who love their towing and diesel. The 6.2L V8 that comes with the SRT grants drivers a stunning 475 hp that can get from 0 to 60 in just 4.8 seconds. Perfect for the drivers that love to go go go! The supercharged 6.2L V8 is available with the Trackhawk trim and offers a massive 707 hp which will get you from 0-60 in a shocking 3.5 seconds. This is truly the SUV for the speed demons of the world who just can’t get enough power. Now while the 2019 Grand Cherokee may look like an elegant piece of art while on the road, it has no issue outperform the best well off the road. Clearly, Jeep offers both a 4x2 and 4x4 option for nearly every Grand Cherokee model in order to bring out the adventurer in all of us. 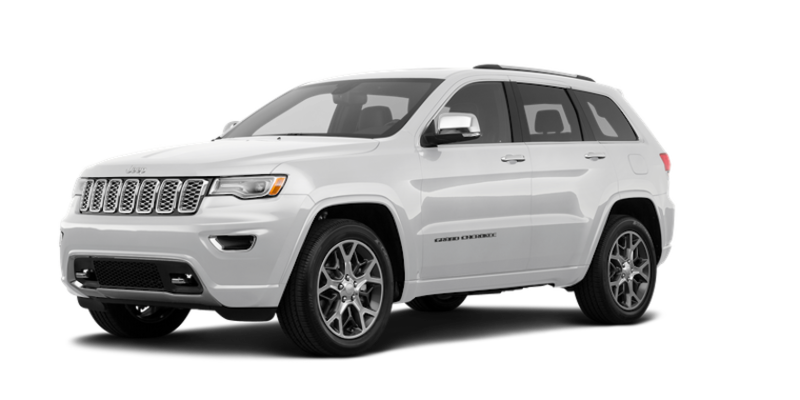 In addition to this though you will find that the Grand Cherokee offers traction control, water fording capabilities, intelligent maneuverability, and trail flexibility that can take on all the elements of man and nature. Ice, slush, rain, snow, rocks, mud, and extreme heat have almost no impact on the rough and stylish Grand Cherokee as it takes on every season without hesitation. All of these features are also easy to use with an advanced terrain system that can change the specs of the vehicle to match the environment with a turn of a nob or push of a button. The 2019 Jeep Grand Cherokee is one of the only vehicles that can easily rate a 10/10 on the performance scale, making it a vehicle every driver can admire. Visit The Faricy Boys in Colorado Springs! At Faricy Boys automotive dealership we have experience in providing our community with the best automotive service possible in order to ensure satisfaction that lasts. The main key to our success is sticking to our integrity and honoring loyalty. We work to get you the best deals possible on the vehicles you love, and we refuse to play games. Our resourceful staff will always work to give you the answers to any number of questions you may have about the process or the vehicles you are interested in. We believe this type of integrity will lead to trust which we hope will lead to loyalty, and we enjoy rewarding your loyalty in any way we can. Looking far and wide you will not find a dealership that takes more pride in their service quality.